A plucky city girl. A tough cowboy. Romance in cowboy country. When a crisis cripples the ranch, stern cowboy Jett Maddox is suddenly promoted to foreman. Just in time for the fall cattle drive. No sweat. Except for the new spitfire cook who is way too soft for wild country. City-girl Marlee Donovan knows failure. She's already on her second career, and her family is sure she'll fail again. But plucky Marlee packs up her chef's knives and heads west for a cook's job on a ranch anyway. She's ready to prove herself. As Marlee struggles with the hardships of life in the west, Jett finds himself falling for her. And Marlee is drawn to the unexpected soft side of the gruff cowboy. But when tragedy at the ranch escalates, a difficult decision must be made...and Marlee's stubborn streak could cost her everything. 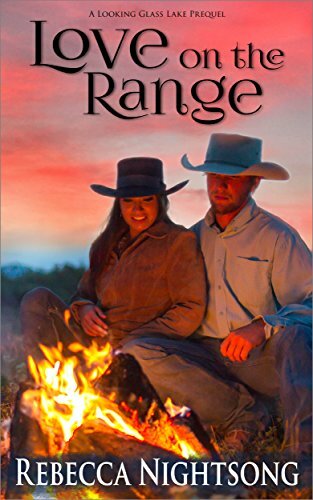 Love on the Range is a prequel to the Looking Glass Lake series of contemporary Christian romance. If you like sweet and clean love stories with quirky characters that get you laughing, then you'll love Rebecca Nightsong's world of imperfect people who dare to put their faith and love in action. Readers of Karen Witemeyer, Brooke St. James, Kimberly Rae Jordan, Liz Isaacson, and Lucy McConnell will love this book. Saddle up and enter cowboy country to start this love story today!